Find out more about our cutting-edge neurosurgical and spine surgical programmes. Get to know more about the talented team of doctors of Sita Bhateja Speciality Hospital. We have launched the fifth edition (Oct - Nov) of "the Buzz". Read about out latest news! The Neurosurgical programme is the standard bearer of Sita Bhateja Specialty Hospital. The Orthopaedic programme consists of highly skilled and qualified medical professionals. Spine surgery, an area of great interest to us, we take great pride in this surgical programme. The most advanced team of gynaecologists and expert team of medical staff to care. Our Head and Neck Oncology Department for treating cancers in the head and neck regions. 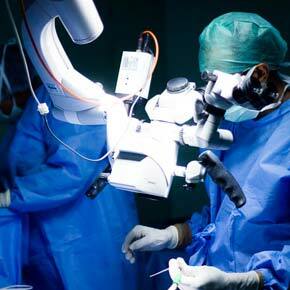 Experienced and skilled team of general surgeons who routinely deal with most general surgical conditions. Our Intensive Care Unit is a bright and cheerful space with plenty of natural light. My family joins me in expressing our sincere thanks to yourself and your team of doctors for the excellent care given to my father. Mr. Boriah, during his stay at your hospital. May I bring to your notice that on this day i.e. 30th Sep Last year i.e.2013, I was operated upon for a Left Parasagittal Meningioma Brain Tumour, by yourself, Dr.Banuprakash.A.S. and team. Since then, today is the first anniversary of the same and I am extremely happy to inform you that I am back to my normal self, alive and kicking. On this SPECIAL occasion, I wish to place on record my sincere thanks and heartfelt gratitude to you, your staff and your entire team. Been to quite a few hospitals in the past, the personal care, friendly staff, most qualified and capable docs make SB hospital my best experience till date. Thanks Dr. Arvind Bateja for everything. I don’t know how to thank you for the successful brain and spine operation of my brother Haji Zafar Alam and for the spirit in which it was done, all the members of our family are obliged to you and thanks from the core of their heart. Please convey our respect to your mother. Dear wonderful people who came into our life when we needed you and took such good care of us. Thank you. Today it is exactly one month since my spinal operation and my wife joins me in taking this opportunity in sincerely expressing our heartfelt gratitude to you and your team of consultants, assistants and nursing staff for the kind and excellent care we received throughout our stay at the hospital and for being such a wonderful surgeon and sensitive human being. It was indeed our privilege to have met you and got to know you. Good Evening Doctor. This is Tanya, Aditri Menon’s mom (room 202). We were discharged this evening and I just wanted to thank you for everything. I just had to let you know that I was so touched by the concern and care that the nurses and the duty doctors showed towards Aditri. It’s not easy looking after a 7.5 yr old patient and they did it with grace and lots of patience . Even the akkas and the cafeteria boys were so polite. We were more than adequately looked after by Dr Amit Bajaj – he answered all my questions so patiently. Again, thank you everything! Pls do share my feedback with your team. The best place to get treated & cured – physically & spiritually. High caliber professionals who put you back on your feet with ease and to be cared for by a highly motivated and courteous team of nursing staff. recuperating while there seems like “home away from home”. A BIG thanks to the SBSH Team. THANK YOU for your help, support and EXCELLENT CARE. I really cannot thank you enough. I am highly indebted to you and the entire SBSH staff. You have an excellent set of people. It’s unusual for me to write a review about a hospital, but I’m putting my review here simply because of a very positive experience we had at SBS hospital in mid-2013. Mrs S, a 25 year old lady came to the hospital with an accidental bullet injury which had occurred a year previously. She underwent surgery elsewhere but the bullet could not be safely extracted. Read about how the neuro experts at Sita Bhateja Hospital teamed up to extract the bullet from her brain. The very thought of losing the use of a limb or part of one’s body is enough to frighten even the strongest among us. Anything that has to do with our brain and the network of nerves that are linked to it becomes a source of major worry for the common man who has no way to fully understand the complexities of neurosciences, a comparatively new and upcoming field, especially neurosurgery. But if you are looking for a doctor or neurosurgeon with tons of experience and who can put your mind at peace in Bengaluru, Karnataka, then look no further than the Sita Bhateja Speciality hospital. 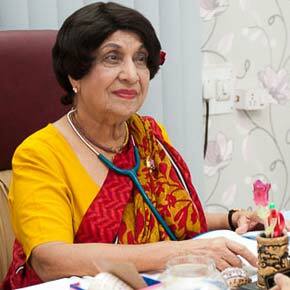 Though this hospital has its roots in a humble Nursing Home set up by Dr Sita Bhateja in 1965, the hospital is currently a force to be reckoned with when it comes to expertise in the field of neurosurgery and spine surgery. The consultant neurosurgeons that make up the team of experts in this discipline are highly experienced and much-decorated professionals in their own specific areas of expertise. With vast amounts of experience and thousands of surgeries under their belt, they use cutting edge technology and the very latest in surgical techniques to reduce suffering of the common man. This eminent group of neurosurgeons keeps upgrading their knowledge by opting for courses to educate themselves on the latest technologies and offer them to their patients in Bengaluru. They are one of the few hospitals that offer minimally invasive neurosurgery to reduce hospitalization time as well as recovery time of their patients. Some of the outstanding procedures conducted in this hospital include ‘awake’ craniotomies, where brain surgery is performed while the patient is fully awake and alert to his/her surroundings. A 34-year-old lady from West Bengal was operated upon for a tumor in the left hemisphere of her brain which was located very close to the center for speech and comprehension abilities. To ensure that no harm was done to that facility, doctors asked her to sing her favorite song, the Rabindra Sangeet, aside from other activities, during the course of her three-and-a-half-hour long brain surgery at the Sita Bhateja Speciality hospital in Bengaluru. The patient had been given full counseling before the procedure to prepare her mentally for an awake surgery and shown her videos of prior awake brain surgeries. Most people would quake at the very thought of being awake through a brain surgery, but the interesting thing is that though the brain provides pain receptors throughout the body, it itself cannot perceive pain as it has no pain receptors!. Another outstanding neurosurgery case was on a 10-year-old girl who was given a second lease on life here after undergoing two unsuccessful surgeries at other hospitals. She had developed a rare spinal cord disorder where the entire stretch of her spine was covered with multiple arachnoid cysts that had led to the development of a series of pockets of fluid collection around the spinal cord, leading to its compression. Though she had been carried into the hospital by her mother on her first visit, by the time her treatment was over, she was an upright walking child, leading a normal life and attending school. These much-publicized cases establish the prowess of the neurosurgeons at this hospital!. Some of the commonly seen neurological conditions at this center include various types of benign and malignant brain tumors, brain metastasis (cancers that have spread to the brain), tumors of the pituitary gland and skull base, malformations of the brain and its tissues, hydrocephalus (abnormal accumulation of cerebrospinal fluid within the brain), stroke, concussion (mild traumatic brain injury), neurofibromatosis (tumors growing on nerve tissue) and trigeminal neuralgia (chronic pain condition associated with this nerve), to name a few. 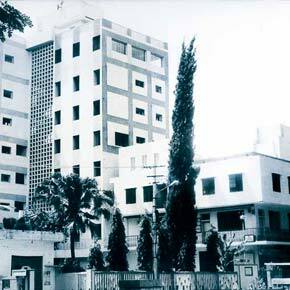 Routinely conducted neurosurgeries at this hospital include craniotomies by removing a part of the skull bone to access the brain for various procedures including tumor excision, micro-vascular decompression (relieving compression of nerves in the head), trans-nasal endoscopic pituitary surgery and expanded approaches to skull base tumors (a complicated surgery of accessing the brain through the nose, thus limiting recovery time), microsurgical excision of vestibular schwannoma with facial nerve preservation, CSF (cerebrospinal fluid) diversion procedures including programmable shunt intervention (for hydrocephalus, intracranial hypertension, etc), ventriculo-peritoneal shunt surgery, carotid endarterectomy and navigation guided brain tumor resection. 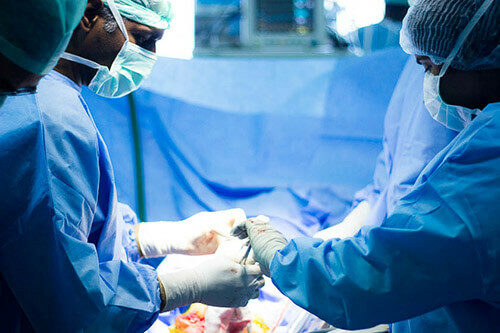 Image-guided surgeries are becoming more refined over the years and are used for complex neurosurgeries; the Sita Bhateja Speciality hospital is one of the few hospitals in the country to utilize this complicated method to navigate around within the skull and spine while performing surgeries. It is the neurosurgeons version of the GPS and enables the surgeon to make smaller exact incisions while navigating through the anatomy of the patient through use of 3D data previously fed into the computer. Smaller incisions also mean less time spent in recovery and less chances of complications. The eminent surgeons that make up the core neurological team include Dr Arvind Bhateja and Dr Banu Prakash, with other supporting consultants and surgeons also joining in as and when required. Dr Bhateja is the team leader as well as the Medical Director of the institute and specializes in neurosurgery. 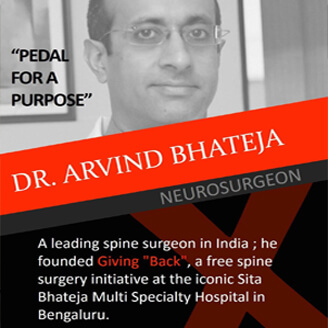 His interests lie in minimally invasive surgical techniques, trans-sphenoidal endoscopic approaches, spinal fusions as well as spinal fusions and skull-base approaches to neurosurgery. He specializes in endoscopic endonasal approach for pituitary tumors which essentially involves going through the nose to access the pituitary gland; his other areas of specialization include microvascular decompression, vestibular schwannoma/acoustic neuroma surgery, minimally invasive TLIF, motion preservation spine surgery, spondylolisthesis, craniovertebral junction anomalies – C1-C2 lateral mass fusion, awake craniotomies, and some of the latest techniques in intra-operative neuro-monitoring and intra-operative fluorescence-guided tumor resections. Dr Banu Prakash who is also central to this team has a special interest in deep brain stimulation, minimally invasive surgery, endovascular techniques and modern methods like 3D endoscopy guided neurosurgeries.He is also interested in robotic surgery and nano medicine for treatments of brain tumors. After spending time with these calm and caring doctors, the patient automatically realizes he/she is in safe hands as they give respect and empathize with every need of the of the patient to make them feel comfortable. In this hospital every patient is a priority, such is the philosophy of the hospital. Here, they make impossible dreams possible with their technical expertise and post-op care – and all this comes at very affordable rates too.